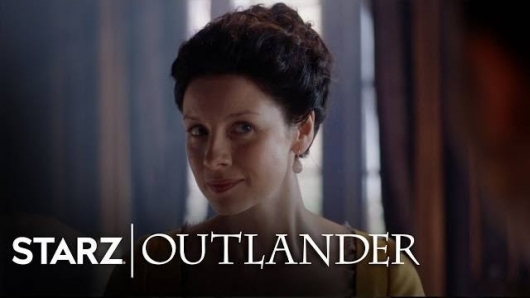 Outlander 2.3 “Useful Occupations and Deceptions” review: Jamie is running on no sleep, going from brothel, to work, to Versailles and back again, in the quest to squash this rebellion by pretending to be on the side of it. Claire has to go to tea. Mary Hawkins (Rosie Day): “I cannot marry a Frenchman!” Louise laughs, but Claire wants to talk with Mary about the birds and the bees. It is only when Mary tells them where she is from that it all comes rushing back to Claire in a wave (in a flashback/flashforward). Frank (Tobias Menzies) had proudly shown Claire his family tree – Jonathan Randall married Mary Hawkins. It is only then that she realized she had not let herself feel the possibility of Frank’s non-existence, when she thought BlackJack was dead. And now she has to protect him from Jamie for a year. She tells Murtagh. He wants them to keep it a secret too, to prevent Jamie from being hanged. Claire visits Master Raymond (Dominique Pinon). She’s worried she is becoming conventional. He tells her of a charity hospital that could always use help. She is put to empty chamber pots, until she correctly diagnoses diabetes (or the 18th century “sugar sickness”). 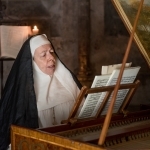 Mother Hildegarde (Frances de la Tour) realizes she is more than a pretty, rich face. Back at the brothel, the prince promises more than the loss of blood and gold. He says wealthy Englishmen have already pledged money to the cause, to the obvious surprise of Jamie. Prince Charles promises an alliance between England and France if he is victorious. Duverney agrees to go to the king as long as gets proof. Jamie gets home before Claire and waits and waits. She comes in all bubbly from her “wonderful” day at the hospital, but Jamie is pissed. As progressive as Jamie is, he still IS a husband in the 1700s. She should be a little understanding of that. 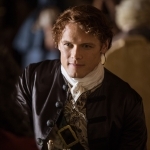 Jamie goes to drown his sorrows in the brothel, where he spies a little pickpocket – Fergus!!! I’ve been waiting for his introduction into the story. 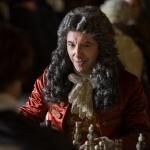 Jamie hires Fergus (Romann Berrux) to pickpocket correspondence to and from the prince, so they can copy them and he can put it back. A genius plan. Murtagh and Jamie try to work through the codes, one of which is hidden in a piece of music. At the hospital, Claire continues to care for the sick under the tutelege of Mother Hildergarde. Her dog, Bouton, can sniff out sickness. Jamie shows up for the Mother to figure out the music – side note – she’s friends with Bach. Jamie finally feels like things are looking up, while the BlackJack secret is weighing her and Murtagh down. This was a delicious, thick episode I needed to savor as I watched. There is so much intrigue and power play in every scene. So much is said in a locking of eyes or a twitch of a mouth. It is amazing how the Ronald D. Moore, the actors, writers, directors, set and costume people bring Diana Galbadon’s words to the small screen with such life. My favorite parts of the episode were the hospital scenes (although gross at times), and Jamie chasing down Fergus to offer him a job. Good job casting with that little one. On “Useful Occupations and Deceptions”: Jamie’s days and nights are dominated by political machinations, while Claire finds solace in her healing skills. As their plan to stop Culloden progresses, including engaging the aid of a young pickpocket, the past threatens to derail their forward momentum. In Paris, it can be hard to tell those who have your back from those who want to stab you in it.